Tiny Atlas is all about those fantastic travel experiences you need to do at least once in your life. We’ve picked some pretty weird and wonderful stuff along with some sensational, breathtaking highlights that make you realise you’re a traveller rather than a tourist, giving you the opportunity to really make the most of some of the world’s more unusual destinations. You’ll find a brief intro and description of each suggestion and, if it takes your fancy, you can click through for the full skinny and detailed instructions on how to make it happen. 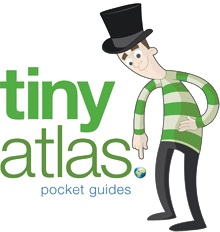 Please note, all Tiny Atlas adventures assume you’re travelling from the UK – it doesn’t mean they’re no use if you’re elsewhere in the world, but if the article includes any ‘getting there’ information, it may, of course, not apply. Tiny Atlas guides sometimes include great tips for neighbouring attractions, accommodation, etc, together with useful contacts, phone numbers and websites. If you’re going to take a city tour of Prague, the only way to do it is in one of the Czech republic’s native little cars – moreover a hot pink Škoda Felicia… fabulous! The rebuilt, reinvented, sleepy corner of Belgium is a perfect base for a World War 1 battlefield tour… it’s also a beautiful and friendly location for a break of any kind, especially if you stay at Vincent Vandelannoote’s wonderful Ambrosia Hotel and indulge in his breakfast speciality! It’s neither camping nor glamping, but this rustic adventure in rural Somerset will appeal to anyone who really wants to get back to nature, and with a jug of scrumpy, some local sausages and half a dozen eggs thrown in, what’s not to love? Eggs Vincent at the Ambrosia – a Belgian indulgence!